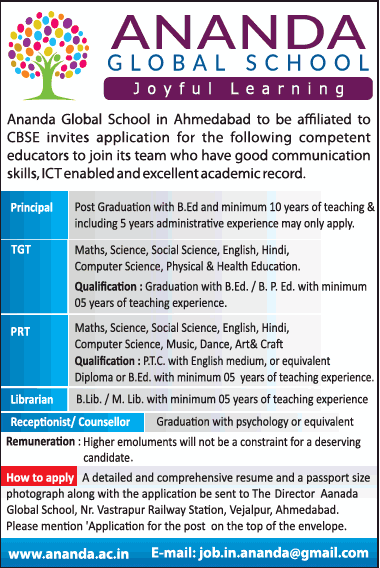 Ananda Global School, Ahmedabad has advertised in THE TIMES OF INDIA newspaper for recruitment of Teachers TGT / PRT / Principal jobs vacancies. Interested and eligible job aspirants are requested to apply immediately from 10th April 2019. Check out further more details below. About School: ANANDA Global School is pre-primary, primary for children between 1.5 to 10 years. Ananda Global School is an innovative educational system that allows any child to begin their learning journey regardless of their location. The welcoming environment is one in which creativity abounds and children thrive with a hands-on educational experience that incorporates art, laughter and the imparting of knowledge, all in a safe and inspirational Environment & Culture. Our beautiful and modern facilities provide each child with the ability to learn and grow physically, cognitively, socially and emotionally. Our full-time programs, a good curriculum that provides plenty of hands-on learning and high quality teachers prepare the children in our schools for elementary school and for life-long learning programmes. How to Apply: Interested and eligible candidates are requested to send their CV along with attested copies of certificates, testimonials and recent Passport Size photograph to the postal address mentioned below. Please mention the application for the post on the top of the envelope.